The little hamlet of Merlin is located northeast of Grants Pass and is the home base for many outfitters and fishing guides. 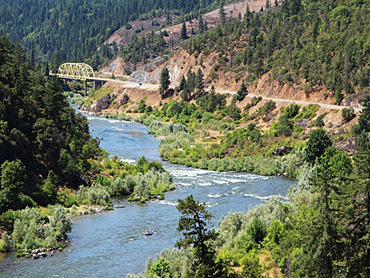 This and the fact that Merlin is close to the 84-mile segment of the Rogue River set aside by Congress under the National Wild and Scenic Rivers Act of 1968, is why Merlin is known as the "Gateway To The Wild & Scenic Rogue River." 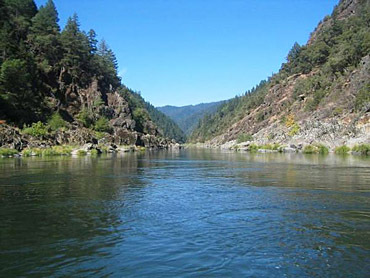 Hellgate Canyon is located here along the Rogue River on Galice Hwy. It is a breathtaking, tall river gorge and is where the famous "Jump" segment of the movie "Butch Cassidy & The Sundance Kid" (starring Paul Newman and Robert Redford) and many other Westerns were filmed. Above Merlin is Grave Creek, the starting point for the 32 mile "wild" section of the Rogue River. 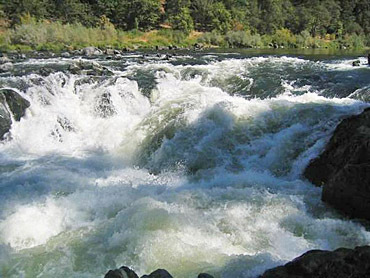 Great white water rafting, fishing and guided tours on the Rogue River are but some of the activities available in the Merlin area. 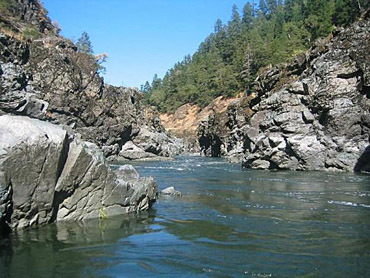 One of the best hiking trails around is the famous Rogue River Wild and Scenic Trail which starts at Grave Creek above Merlin and runs downstream 40 miles through the Wild and Scenic section of the Rogue River to Foster Bar. A permit, available by lottery, is required in the summer for floating some sections of the river; contact US Forest Service, River Permits, 14335 Galice Rd., Merlin, OR 97532. Historical Background - Louis Galice, a French doctor, was one of the first to prospect in the wild country of the lower Rogue canyons. In 1851, a few miles below Hellgate Canyon, he discovered gold nuggets in the creek which now bears his name. 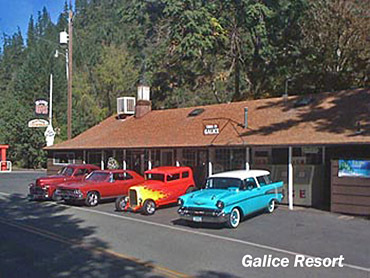 Galice Resort is a famous stopping point along the Rogue River. Food, entertainment, rental cabins and a drop off spot for whitewater rafting. 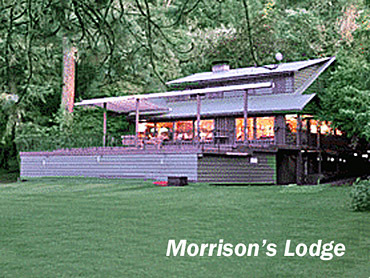 Morrison's Lodge is a beautiful resort and getaway along the Rogue River. See our Lodging Section. IF DRIVING ON BACK ROAD FROM MERLIN TO AGNESS. It is a very dangerous mountain road, it takes 3 hours to drive 25 miles, and the east entrance is not clearly marked as a dangerous road. There have been several accidents on this road, including one nationally publicized accident that ended in tragedy. Perhaps if the road was marked as a particularly dangerous mountain trail, then there would be fewer accidents. This Reservation was created in part, in gratitude for one of the local Indians, Umpqua Joe, who in 1855 warned white settlers in the area of a pending massacre. Thanks to Joe's warning the settlers were able to thwart the Indians attacks. Joe was allowed to stay on the land and operated a ferry for local miners. When Joe died in 1886, which is a story in itself, his oldest daughter named Mary and known as Indian Mary by the locals, stayed on the property and continued to operate the ferry. Not long after Joe's death, the area under the Indian Homestead act, became a reservation, thus showing the nations gratitude and assuring that Mary would maintain control over the property. Eventually she leased the property to the local stage line and moved to Grants Pass. The property changed hands several times and was purchased by Josephine County in 1958 to be converted into what is now known as Indian Mary Park. Today the Park welcomes visitors from literally all over the world. Listed as one of the top 10 parks in Oregon by the state's largest newspaper, the Oregonian, Indian Mary Park is surrounded with many points of historical interest, from old Indian battles, gold mines, Chinese labor camps and others. 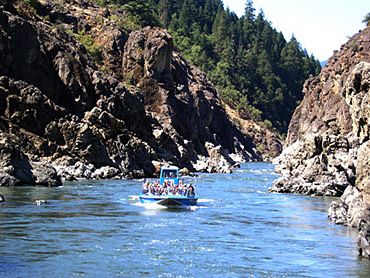 Recreational Highlights - Hellgate Excursions Jet Boat rides/tours along Rogue River. For an interesting journey back in time visit the legendary Pottsville, the home of historic gas engines and buildings. It is located on Pleasant Valley Rd., off of Merlin-Galice Hwy. See out Recreation Section. Visit the site of the Haines Family in Merlin. One family's fight against a band of angry warriors and the massacre that happened within sight of the apple tree. See our Attractions Section.